GRAND RAPIDS, MICH. – A rally was held Wednesday night for a Grand Rapids non-profit. The Rising Grinds Cafe was destroyed in a fire just a few months before it was set to open. “I watched it burn and it was like 3 years worth of hopes and dreams burning to the ground,” says Justin Beene the Director of the Center for Transformation. The cafe would employ youth from the Madison Square Neighborhood. Beene says with the support of the community they will rebuild. 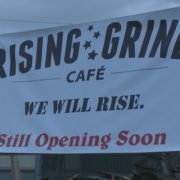 “You know it was one of our youth who named the cafe rising grinds and today, this idea of rising from the ashes means more than it ever did before,” says Beene.